Anybody could use a pair (or more) of push clamps around their shop. Those handy devices convert your machine' table into a huge vise. They are pretty mush irreplaceable when machining plates and other oversized parts that no ordinary vise will fit. Several vendors offer their clamps. But many of them tend to be pricey. And those that are not, lack in quality. And to be honest with you, it does not look like they are worth the amount of money their seller is trying to get from you. In the mean time their design is simple enough to fabricate in any shop. 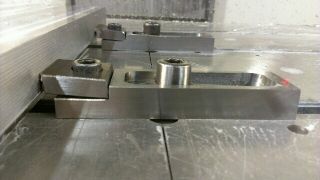 Here is a picture of two of four clamps i made for myself on manual mill withing 2 hours- sure beats buying mitee-bitees for 175$ a pop!!! 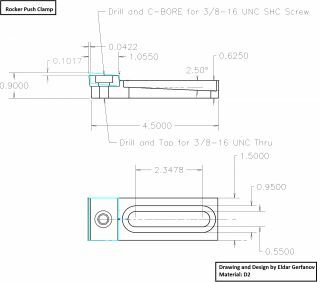 1" long Shoulder in the front is tapped to 3/8-16 NC. Slot for 1/2-13 bolt is sloped towards the back to prevent clamp from sliding under clamping pressure. A thick 1/4" washer is used to protect T-slot from damage by the socket head. I ll try to get more pictures tomorrow. So i uploaded an assembly drawing. Just letting the readers know now there is more detailed info available.